Downfall and Come and See are not really all that similar, formally at least. However, they are the last two films about World War Two that I watched and, better than any other war films I’ve seen, they show the horror, the insanity and the hopelessness of war. I decided to write about them together because of this link, and to try a slightly different format. Both films offer a viewpoint we are not really accustomed to, whatever we know about the war, and neither becomes jingoistic or clichéd. Downfall follows the last day or two of the Third Reich before the Russians take Berlin and end Hitler’s mission. To begin with, it is notable for being a German film that takes a point of view inside Hitler’s bunker – that of his secretary, Traudl Junge. Junge died in 2002, having offered an intimate account of those last days in both a book and a documentary film (which I have not seen). Downfall is based on her book, as well as on Inside Hitler’s Bunker by Joachim Fest. It amalgamates these two reliable sources into a definitive film on the subject, a film that is masterful in every aspect. Technically, it is magnificent. One feels truly transported to the real scenes as they occurred, like in so few other films (especially war films). Clearly, the crew have meticulously researched the necessary details to come up with a realistic setting. It is director Hirschbiegel’s task to make this setting cinematic, and he does so without ever resorting to cheap camera or editing tricks. He allows the inherent fascination of the subject to come through, shooting it in a variety of ways to maximise its effect. Shots down long rooms are memorable, but so are wide shots of Berlin being bombed, and tight closeups on an actor’s face. He never puts a foot wrong. With that out of the way, I can focus on the people. Junge is portrayed as extremely vulnerable, perhaps only halfway aware of the grand situation but acutely aware of the danger of remaining in the bunker. Lara, the actor, is so pretty it’s easy for her to tug at our heartstrings, but she doesn’t fall back only on that. Her dialogue is delivered directly, nervously, but always warmly, and one cannot help but wish dearly that she will survive. Of course, we already know that she does – spoken comments from the real Junge bookend the film – but one becomes so immersed in the experience, you more or less forget what you knew beforehand. Junge is the only person who can bring out vulnerability in Hitler, as evidenced by the shot above. He is often warm and friendly, but we only see weakness in him when he looks into Junge’s eyes, and they are great moments. We do also see him becoming angry and irrational, and Ganz’s work in these scenes is absurdly good. His performance as a whole is the high watermark of a glittering career that has seen him work with Schaffner, Herzog and Wenders. Any doubts you might have about an actor being able to convincingly portray Hitler are quashed as soon as he appears on screen. Eva Braun seems in denial of the whole thing. She insists that the dancing continue at a party that is being bombed and, in yet another image burned into my brain, applies lipstick in the mirror and half-smiles. Half of her fights to believe that there is still hope against the other half which knows, very practically, that the end is very close indeed. It’s horrible to imagine that struggle of faith – how would you cope if the tanks were bearing down but you husband insisted on remaining to the last? Possibly the most distressing scene in the film concerns Frau Goebbels and her children; even if you know what happens, it is incredibly affecting to watch. She is the most unshakeable character in the film, the most brainwashed, heavily influenced as she is by her husband (who, in one scene, shows himself to be of very weak will as he waits outside a particular bunker). Nearly everyone retains some semblance of faith in the Fuhrer and the Fatherland, but they are all without hope. The practicality of the resolution of many – suicide – is jarringly insane, but clearly the only way they see to end the conflict. There is so much death, it is overwhelming but never desensitizing. I nearly bawled my eyes out in several places. And when genuine hope finally appears, it is as though a great weight has been lifted. The immersive realism of Downfall is in direct contrast to the atmosphere and occasional beauty of Come and See. It is more like a collaboration between Kubrick and Herzog on a brutal, unflinching war film. Produced by the Soviet Union government to commemorate 40 years of the war having ended, it focuses on how Bielorussia (now independent as Belarus) was caught between Moscow and Berlin and was more or less completely sacked. We follow a boy of 12, Florya, as he joins the army in the crusade against the Evil Hun. Very quickly, his illusions of glory in Stalin’s service are shattered – his company leaves him behind to guard the camp, which is subsequently bombed to oblivion. Thus begins a series of episodes as Florya attempts to gain a foothold in the war, something, somewhere, anything to give his life meaning beyond continued survival. 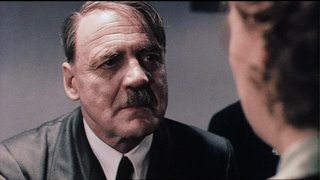 Downfall illustrates the hopelessness of war on a personal level; Come and See illustrates it for the many, forcing you to appreciate the unbelievable horror of it all. There are burned bodies still breathing and talking; entire towns incinerated; captured soldiers pleading for their lives. I foolishly ate a sandwich as I watched, and countless times I would get it within an inch of my mouth before being frozen in horror at what I was seeing. It is a relentless stream of remarkably shocking images, tied together through the plight of this young, no longer innocent boy. The images are depraved, but there is a poetry about them all. A cow’s rolling eyeball is mesmerizing, as is a human face laughing rapturously as it looks upon intensely evil deeds. In a way, much of this film is quite beautiful, conveying an ethereality of war that most films eschew in favour of gritty realism. This doesn’t diminish its impact; in fact, it hits even harder when you are made aware that none of this is a dream. It really happened, probably much like this. It would have been difficult to believe, at any stage, and always horrifying. I must also make note of the sound design, which is amongst the most impressive in all the films I have seen. It goes some way towards immersing us in the hellish, bewildering environment of war. Aleksei Kravchenko gives one of the great child performances as Florya. For the second half of the film, he rarely speaks, but his face ages visibly – not just with the makeup. Starting out a fresh-faced, smiling, hopeful boy, his facial expression becomes flatter and more hopeless as time wears on. Finally he becomes angry, and in a completely against-the-grain (but certainly effective) montage he unleashes all his aggression, signalling a new focus in his life. He has found a reason to march with the army, and the necessary will to be taken seriously. Like the will of the characters in Downfall, his drive is profoundly affecting in its insanity. 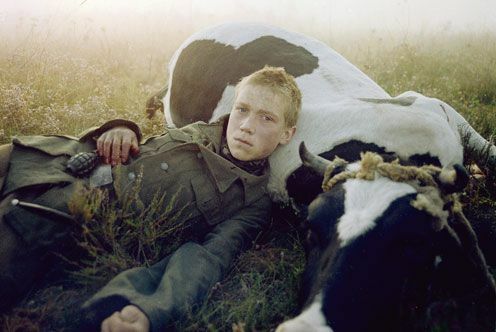 This was director Klimov’s last film, though he lived for a further eighteen years. I can understand why one might end their career with a film as stunning as this. It isn’t as complete a film as Downfall, particularly in its one-sidedness, but its unflinching eye hits you harder. I warn you, do not watch these two films on a double-bill – the effects could be dire. Do watch them both, though, if you can and feel you’re up to it. I haven’t seen two better films about war, ever, nor have I seen two films which so conclusively argue against there being any more war. Well, this turned out to be more like two reviews back-to-back than a comparison piece. Oh well. I am still learning.